If you have COPD, you may have heard that COPD is an "independent risk factor" for lung cancer. What does this mean? How are COPD and lung cancer related? We know that there is a link between COPD and lung cancer. After all, the leading cause of both diseases is smoking. Yet, what many people do not realize is that the link between COPD and lung cancer goes beyond a common cause such as smoking. Never smokers who have COPD are much more likely to develop lung cancer than never smokers without COPD. People who have COPD and smoke have a much higher risk of developing lung cancer than people who smoke the same amount but do not have COPD. In fact, among people who smoke, COPD is the greatest risk factor for developing lung cancer. In addition to COPD being a risk factor for lung cancer, there are several other important issues (both for those with COPD and those with lung cancer.) Having COPD can make it difficult to recognize the symptoms of lung cancer, and hence, delay the diagnosis. At the same time, we know that the prognosis of lung cancer is better the earlier it is diagnosed. Once diagnosed with lung cancer, COPD can also interfere with the potential treatments for cancer. What do you need to know if you have COPD, lung cancer, or both? Before going further, it's important to define what we mean by chronic obstructive pulmonary disease or COPD. COPD is a group of diseases characterized by obstruction of the airways in the lungs. In contrast to obstruction of the airways which is reversible (as with asthma) the obstruction in COPD is not completely reversible with treatment. In addition, the disease is usually progressive (gets worse) over time. Emphysema—Emphysema is a chronic lung disease characterized by damage to the alveoli, the tiny air sacs at the end of the airways through which the exchange of oxygen and carbon dioxide occurs. Loss of elasticity of the alveoli results in air becoming trapped in the alveoli. This, in turn, causes the alveoli to expand and rupture, causing further damage and scarring. Chronic bronchitis—Chronic bronchitis is a condition characterized by inflammation and scarring of the airways. This inflammation results in mucus accumulating in the airways, plugging the airways and often causing recurrent infections. Bronchiectasis—A condition often caused by repeated lung infections in childhood, bronchiectasis causes widening and scarring of the airways. As noted earlier, COPD is not only a risk factor for lung cancer, but is likely the greatest risk factor. To be an "independent" risk factor means that something may increase the risk of lung cancer alone—all by itself. This means that if two people have never smoked and one has COPD, the one with COPD would be much more likely to develop lung cancer than the one who does not have COPD. It means that if two people smoke exactly the same number of cigarettes for the same number of years, the one who has COPD is much more likely to get lung cancer than the one without COPD. There are over a dozen studies which have found COPD to be an independent risk factor for lung cancer, though the degree of risk varies somewhat and ranges from a 2-fold increased risk to a 10-fold increased risk, Overall, it appears that COPD raises the risk of COPD 2-fold to 4-fold in light to moderate smokers and never smokers, and even more in heavy smokers. When looking at statistics about COPD and lung cancer it's important to first note how common these diseases are in the United States. Cancer is the second leading cause of deaths in the U.S. (after heart disease) and lung cancer is the number one cause of cancer-related deaths in both men and women. COPD is now considered the 3rd or 4th leading cause of death in the U.S. Around 11 million Americans have been diagnosed with the COPD and it's thought that an even greater number of Americans are living with COPD which has not been diagnosed. This translates to eight to ten percent of the population having some degree of COPD with that number rising to ten to twenty percent of smokers. Studies vary on the precise number, but it's thought that 40 to 70 percent of people with lung cancer have COPD. Not all of these people may have received the diagnosis of COPD, but pulmonary function tests show some evidence of COPD in the majority of people with lung cancer. Among those with COPD, approximately one percent will develop lung cancer each year. We know that COPD increases the risk of lung cancer regardless of smoking, but how does this happen? There are several theories. One theory is that there are genetic factors common to both COPD and lung cancer. In other words, there is an overlapping genetic susceptibility which makes some people more likely to develop both of these diseases. One example, the hereditary condition alpha-1-antitrypsin deficiency increases both the risk of COPD and that of lung cancer, but it's likely that there are several genetic denominators yet to be clarified. Yet another theory is that the chronic inflammation in the airways related to COPD may lead to lung cancer. We know that chronic inflammation can sometimes lead to cancer, for example with esophageal cancer and cervical cancer. Finding lung cancer in the early stages can significantly increase survival, but until we have a widespread screening test for everyone, we often have to rely on recognition of the early signs and symptoms of lung cancer. The problem is that many of the symptoms of lung cancer are "normal" symptoms among those living with COPD. For example, both diseases tend to cause a persistent cough, shortness of breath, repeated lung infections, and even weight loss. In contrast, the most common type of lung cancer diagnosed today is lung adenocarcinoma. These cancers tend to grow in the periphery of the lungs, and as such, slowing increasing shortness of breath, often only with activity at first, is often the first symptom. This dyspnea (sensation of shortness of breath) found with COPD can appear very similar to the shortness of breath that might herald a lung cancer. Not only does COPD appear to be a risk factor for COPD (and make diagnosis more difficult) but treating lung cancer can be more difficult. People with COPD may not be able to tolerate treatments such as a lung cancer surgery or radiation therapy which might lung volume. Keep in mind that treatment, and even surgery, however, is possible for people with mild or even moderate COPD. If you have COPD and are diagnosed with lung cancer, make sure to find a physician who will work with your COPD to treat your lung cancer. You can think of this as being similar to elderly people with lung cancer. It has often been thought that the elderly are unable to tolerate the rigors of cancer treatment. Yet studies are finding that elderly people, especially those with a good performance status, meaning that they can live somewhat independently, not only have a better survival rate but better quality of life when they are treated for their cancer. If you have COPD, talk to your doctor about the risk of lung cancer. Find out if and when you should be screened, and become familiar with the signs and symptoms of the disease. Take care of your health, not only to decrease any risk factors you may have for lung cancer but to make sure you are as healthy as possible if you should develop the disease. A January 2017 study found that high-dose inhaled corticosteroids may have a protective effect against the development of lung cancer in people with COPD. Talk to your doctor about this finding as well as any new research on the subject. Even though COPD is a risk factor for lung cancer, there are not yet guidelines stating when a person should be screening. Talk to your doctor as this will likely change in the near future. If you have COPD (but not lung cancer) -The bottom line for people with COPD is to be aware of the increased risk of lung cancer. Talk to your doctor about lung cancer screening keeping in mind that we don't yet have guidelines on how to screen people with COPD for lung cancer. Carefully review the signs and symptoms of lung cancer and see your doctor if you develop any of these (don't dismiss your symptoms thinking that they are due to your COPD.) Take care of yourself, and see if there are any risk factors for lung cancer that you can change. For example, if you haven't checked your home for radon, do so right away. Taking care of your body may not only reduce your risk but will put you in a better position if you do develop lung cancer. 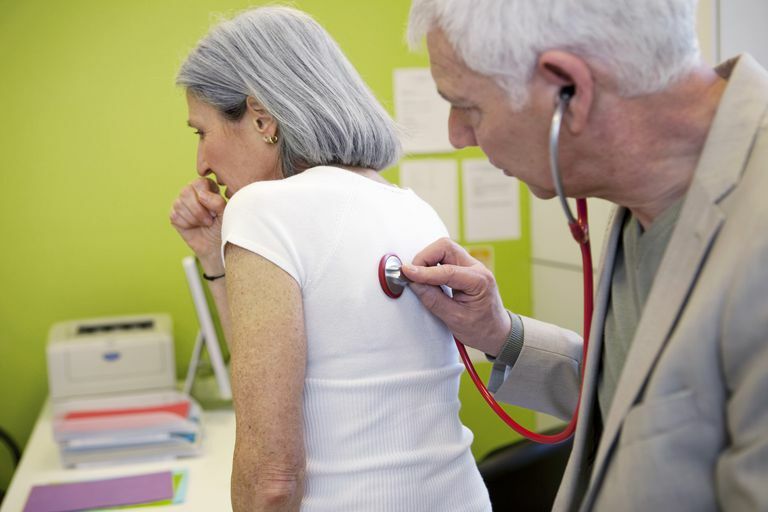 Talk to your doctor about the management of your COPD, and ask what she thinks about the studies which suggest inhaled corticosteroids may decrease their risk of lung cancer. If you have lung cancer (but not COPD) - If you have lung cancer (but have not been diagnosed with COPD) it's important to be aware that the majority of people with lung cancer have some degree of COPD (but it may not have been diagnosed.) This is true whether or not you have ever smoked. When we approach treatment for cancer, it's common for everything else to be put on the back burner, but to be as healthy as possible in facing your cancer treatments, it's important to treat your COPD if you have it. If you have both COPD and lung cancer - If you have both COPD and lung cancer, it's important to be your own advocate. Too often when a person has two different conditions, one gets put on the back burner. Yet both of these conditions need to be equally addressed to give you the best quality of life possible. If you have neither COPD nor lung cancer - Even if you have do not have either COPD or lung cancer, the information in this article is important. It's thought that early detection of COPD is important for lung cancer surveillance—being aware of the symptoms of lung cancer and having CT screening when appropriate. This is important whether or not you have smoked. Lung cancer in never smokers is now the 6th leading cause of cancer-related deaths in the United States and COPD occurs in never smokers as well. Barreiro, E., Bustamante, V., Curull, V., Gea, J., Lopez-Campos, J., and X. Munoz. Relationships Between Chronic Obstructive Pulmonary Disease and Lung Cancer: Biological Insights. Journal of Thoracic Disease. 2016. 8(10):E1122-E1135. El-Zein, R., Young, R., Hopkins, R., and C. Etzel. Genetic Predisposition to Chronic Obstructive Pulmonary Disease and/or Lung Cancer: Important Considerations When Evaluating Risk. Cancer Prevention Research. 2012. 5(4):522-7. Raymakers, A., McCormick, N., Marra, C., Fitzgerald, J., Sin, D., and L. Lynd. Do Inhaled Corticosteroids Protect Against Lung Cancer in Patients with COPD? A Systematic Review. Respirology. 2017. 22(1):61-70. Sekine, Y., Katsura, H., Koh, E., Hiroshima, K., and T. Fujisawa. Early Detection of COPD is Important for Lung Cancer Surveillance. European Respiratory Journal. 2012. 39:1230-1240. Takiguchi, Y., Sekine, I., Iwasawa, S., Hurimoto, R., and K. Tastumi. Chronic Obstructive Pulmonary Disease as a Risk Factor for Lung Cancer. World Journal of Clinical Oncology. 2014. 59$0:660-6. Wang, H., Yang, L., Zou, L. et al. Association Between Chronic Obstructive Pulmonary Disease and Lung Cancer: A Case-Control Study in Southern Chinese and a Meta-Analysis. PLoS One. 2012. 7(9):e46144. What Is the Risk of Lung Cancer After Quitting Smoking?